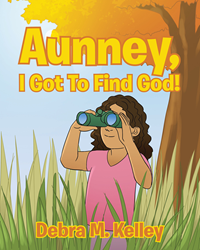 “Aunney, I Got To Find God!” from Christian Faith Publishing author Debra M. Kelley is the delightful children’s picture book story about a little girl named Harmony who decides to look for God but is frustrated when she can’t find Him in the trees, clouds, under her bed, around the house, or even in the church—only for her Aunney to reveal to her during the bedtime prayer where Harmony can always find God. “Aunney, I Got To Find God!”: an adorable story of a little girl locating God. “Aunney, I Got To Find God!” is the creation of published author Debra M. Kelley, a loving mother, aunney, and grandmother who lives with her husband on a small hobby farm in Central Minnesota with their two cats and two dogs, where they love camping, pontooning, and four-wheeling as a family. Published by Christian Faith Publishing, Debra M. Kelley’s book is the first installment in the series of children’s books featuring Harmony’s innocent questions about God and faith that reveal profound truths to the grownups around her. Young readers can follow Harmony on her discoveries in faith, learning to ask the questions that matter. View a synopsis of “Aunney, I Got To Find God!” on YouTube. Consumers can purchase “Aunney, I Got To Find God!” at traditional brick & mortar bookstores, or online at Amazon.com, Apple iTunes store, or Barnes and Noble. For additional information or inquiries about “Aunney, I Got To Find God!”, contact the Christian Faith Publishing media department at 866-554-0919.